Created in 2014, ACTA’s Bike Connections is the first map created specifically for cyclists in the Airport Corridor. The map shows local bike trails – it even indicates which ones are hilly – and the roads with which the trails connect. 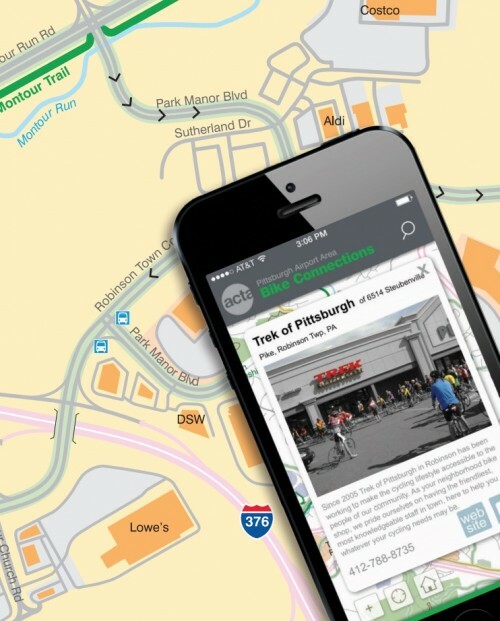 It also shows business areas, locations of bike shops and bike racks, parking areas for trail access, and much more. The map is color-coded to identify places of interest to cyclists, from shopping and dining to parks and corporate campuses. Interactive versions of the map are available online at actabikemap.org and as a free smartphone app – search both Android and iPhone stores for “ACTA bike map” (at the Google Play store, be sure to include the quotes. The paper map is available from ACTA at no charge; there’s a waterproof version that can be purchased below for $5.00.